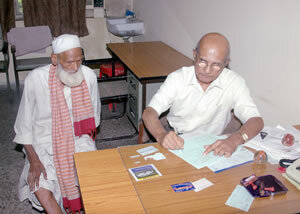 The patients attending the Institute are registered at the registration counter of the Institute located at reception. They are examined by the doctors including Orthopaedic Surgeons, pediatrician, physicians and other doctors in the assessment clinic for their rehabilitation requirements. After initial assessment, the patients are sent to various out-door units such as Physical Therapy, Occupational Therapy, Speech Therapy for providing therapeutic treatment and Workshop for fitment of aids and appliances. The persons with disabilities and patients disabling conditions come either directly to the Institute or are referred by other organizations for comprehensive rehabilitation/treatment. The Institute provides the services of a clinical psychologist on Thursdays and Fridays for giving psychological counseling to the patients, persons with disabilities and their relatives. Family counseling, social counseling and vocational guidance services are also provided to disabled persons and their family members.